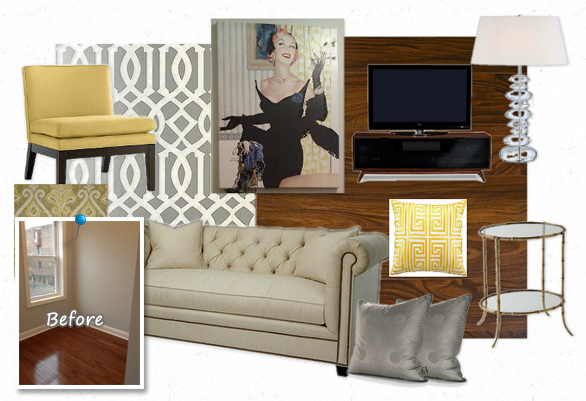 We’re loving Stephanie’s oliohop post for her great do’s and don’ts when staging a home. There are so many things that you might not think to be important when staging a home. Be sure to check out her tips to make sure you are not hurting your chances of a sale. The beautiful colour scheme she has created in her design is calming and comfortable making the home feel inviting to possible buyers. Great work Stephanie. Thanks for joining our January hop. P.S. I’m in love with the sofa and coffee table! “It can be overwhelming for a potential buyer to walk into a large and not-so-usual square space. At that very moment the buyer is thinking, nice space but what do I do with it or how do I fit my furniture into this space. The trick here is to show them how they could maximize every inch of this space by creating livable and engaging clusters of furniture. Creating separate workable areas in one space with flow is a perfect solution.” – Marilyn. This and many more tips on color and exterior staging can be found in this great post. As a designer, how should you present your staged concepts to your homeowner to help them visualize the space? Just follow Linda’s lead. We are loving her inspiration boards comprised of the olioboard that shows her vision, a call out of major design elements that are needed to complete the look, pricing and more. This board can be saved as a jpg and easily sent to the owner by email. If you are running an e-design platform and have customers that are miles away, this is the perfect solution. It simplifies the presentation process for you and the client is happy with the fast turnaround. Staging a home 101. Lisa breaks it down into easy to follow steps including removing personal items and clutter, cutting down on the furniture to make the rooms feel larger and helping buyers see the value in each space. Multiple before and after shots clearly demonstrate the effectiveness of her tips. Love your final trick Lisa. “Always have a couple large laundry baskets in the garage, for those times you get the spur of the moment call to show the house. You can gather any piles of mail, errant clothing, or other messes and load them into your car to take with you. It’s a quick way to straighten your house and do away with any messes.” Brilliant. When a home sits on the market for a year with no offers what do you do. You call in Frances. This post of an actual staging project shows how the right design can change that “For Sale” sign out front to a “Sale Pending” sign. After Frances transformed this home, it received multiple offers within 22 days. If that is not a ringing endorsement for staging and hiring a professional like Frances, I don’t know what is. On a side note, way to go Frances for taking a chance on a bold color scheme that clearly paid off! The most difficult rooms to sell to a potential home buyer are the rooms that a homeowner has personalized ‘too much’. While it’s fine to showcase your favorite colors, hobbies, and interests in your home, the moment you decide to put your home up for sale – it must no longer be about your needs and wants. 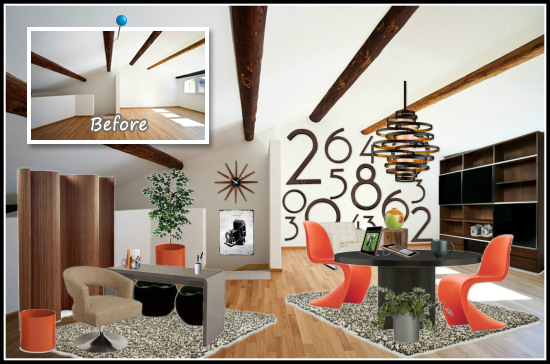 It can be hard for a potential buyer to envision themselves in a space when it is so clearly designed or someone else. 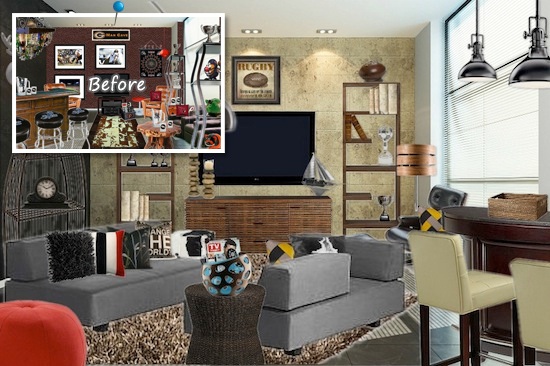 In this post Ronique takes on the most personal space of all – the mancave. 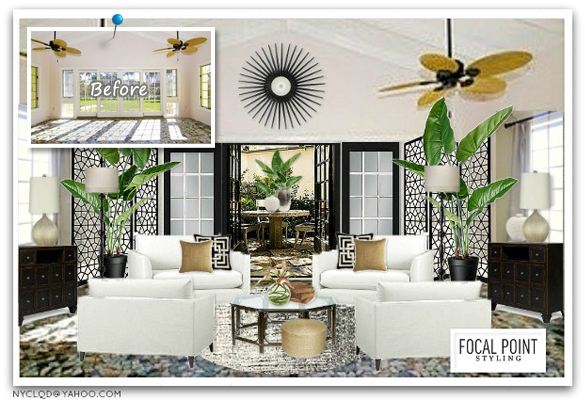 Follow Ronique as she takes this overly personalized room and changes it into a family friendly room that could be appealing to potential home buyers. First off, I would like to say thank you to Designer Marketplace for participating in our January Oliohop. Thank you so much for the beautiful write up on Olioboard. We appreciate all the support you have given us and we are very excited for the West Elm Q&A Olioboard event tonight in Vancouver. 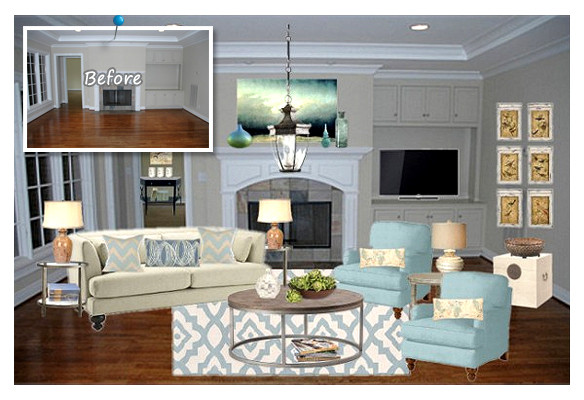 If you are a fan of color, you will love the staging design DM created for this Oliohop. The red color breaths life and energy into the space without detracting from the beautiful architectural details of the home. When you have architectural elements like these, you want to show them off as much as possible to highlight the attention to detail that went into the build of the home. Lynda’s post is about a listing she saw in 2010. Using it as a backdrop, she shows us her take on staging the home for sale. What’s fantastic about this post is that Lynda also shows how the home was actually staged for resale in 2012. 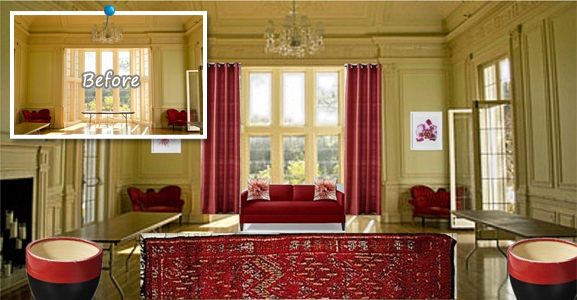 Two staging options for one home. 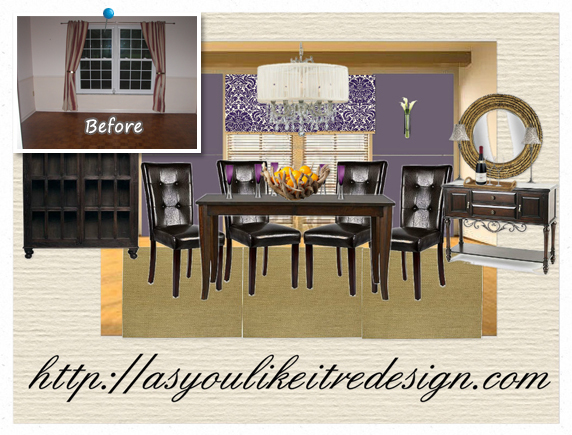 Follow her blog post as she walks us through her decisions from room to room on staging this home and then compare her beautiful design to the actual staging of the home. Fantastic tips and absolutely beautiful moodboard designs. As a stager, sometimes you are limited to the items you have available from a particular rental company. 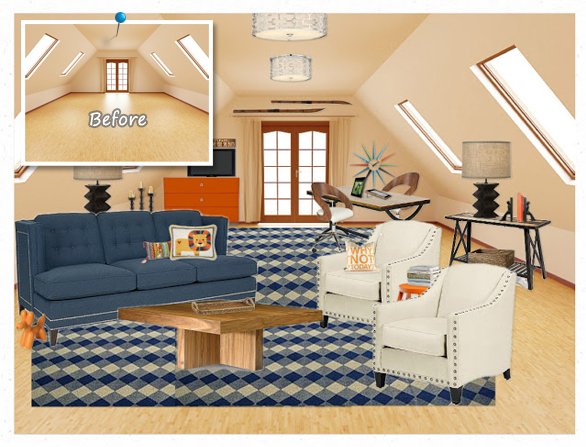 But as Kristie shows us, you are not limited when you are virtually staging with Olioboard. 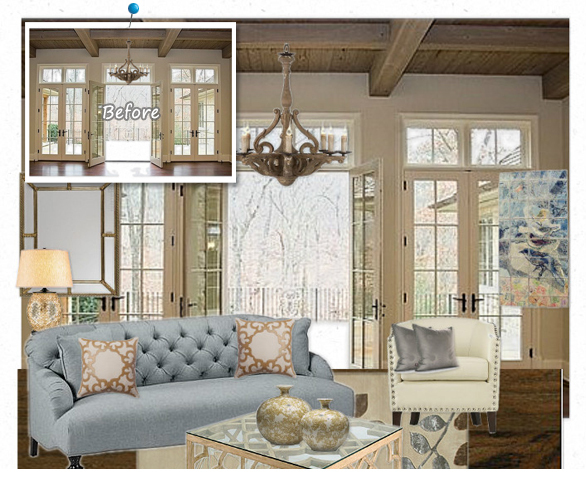 Kristie’s fantastic explanation and walk-through of her boards helps us understand the psychology behind the design that can help buyers visualize themselves in the space. Staging small spaces can be a challenge. You don’t want the place to look cramped and cluttered. Choosing appropriate furniture and designing a floor plan with flow is key. Roslyn’s small rowhome project is the perfect example of how to make the most of a tiny space. 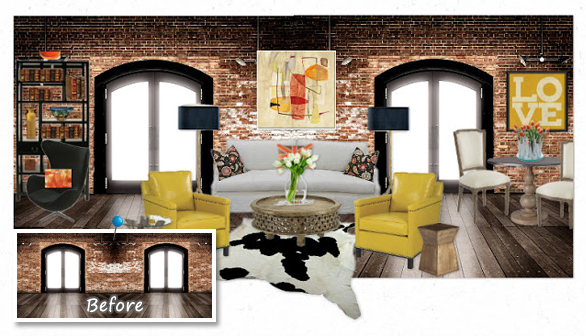 We love how Roslyn was able to use Olioboard to create a moodboard for the space which she then used as a guide to finish the actual project. Love the colors Roslyn.